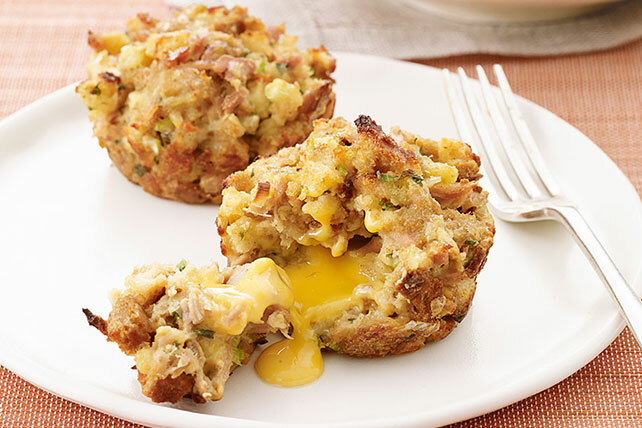 There’s nothing tiny about the big, cheesy flavor of these delightful tuna minis, thanks to the surprise of VELVEETA inside. Mix all ingredients except VELVEETA until blended; spoon into 12 muffin pan cups sprayed with cooking spray. Press 1 VELVEETA cube into center of tuna mixture in each cup, completely enclosing VELVEETA cube. Bake 15 min. or until golden brown. Cool 5 min. before removing from pan to serve. Prepare using KRAFT Light Mayo Reduced Fat Mayonnaise and 2% Milk VELVEETA.